Harland and Wolff has won a contract to supply parts of wind turbines for a project off Germany - supporting 80 jobs in Belfast. 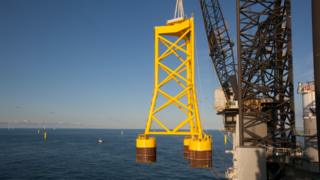 It will make suction buckets used to anchor the turbines to the sea bed for a Polish company, ST3 Offshore. UK Trade Minister Greg Hands said: "This multi-million pound contract is a boost for high-skilled manufacturing jobs in Northern Ireland." It is the second major turbine-related order for Belfast in recent months. Last November, it landed a £20m contract with wind farm developer Scottishpower Renewables. The latest order relates to DONG Energy's Borkum Riffgrund 2 project, a windfarm being built off the German coast in 2018. "Harland and Wolff is delighted to be involved," said Jonathan Guest, the company's director of business development. "We are committed to the retention of manufacturing skills in Northern Ireland and projects such as this enable us to both develop our in-house capability and support the local supply chain." Harland and Wolff built its last ship in 2003 and its more recent work has included refurbishing oil rigs, as well as work in the renewable energy sector.